GOLDENBAUM, Jean. Spiritualität – Auf der Suche nach Sinn und Erfahrung: Eine Stimme aus dem Judentum: Dr. Jean Goldenbaum (Spirituality - In search of meaning and experience: A voice from Judaism: Dr. Jean Goldenbaum). Lecture. Begegnung - Christen und Juden e.V. . Jüdische Gemeinde Hannover. Hannover, Germany. 16th January 2019. GOLDENBAUM, Jean; CROWDUS, Miranda. Introduction to Jewish Music. Workshop. Center for World Music, Universität Hildesheim. Hildesheim, Germany. 18th November 2018. GOLDENBAUM, Jean. Introduction to my post-doc thesis: "Identidad and Zehut on the staff: The History of the Jewish Classical Music Composers in Latin America". Lecture. HMTMH Kolloquium Musikethnologie / Jüdische Musikstudien. Hannover, Germany. 2nd February 2018. GOLDENBAUM, Jean. Música Erudita Brasileira: das origens à contemporaneidade. (Brazilian Classical Music: from the origins to contemporaneity). Lecture. Teatro Décio de Almeida Prado, São Paulo, Brazil. 30th November 2017. GOLDENBAUM, Jean. Música Erudita Brasileira: das origens à contemporaneidade. (Brazilian Classical Music: from the origins to contemporaneity). Lecture. SESC Piracicaba, Piracicaba, Brazil. 28th November 2017. GOLDENBAUM, Jean. A Música na Bíblia Judaica. Lecture. Universidade Metodista de Piracicaba, Piracicaba, Brazil. 25th November 2017. GOLDENBAUM, Jean. Masterclass de Composição Musical. Masterclass. Escola Municipal de Música, São Paulo, Brazil. 23rd November 2017. GOLDENBAUM, Jean. Marc Chagall e a Música na Bíblia Judaica. Lecture. Fundação Ema Klabin, São Paulo, Brazil. 18th November 2017. GOLDENBAUM, Jean. Music in the Jewish Bible. Lecture. Institute of Jewish Studies of the University of Antwerp, Antwerp, Belgium. 16th November 2017. GOLDENBAUM, Jean. Music in the Jewish Bible. Lecture. Limmud Marseille, Marseille, France. 30th April 2017. GOLDENBAUM, Jean. Music in the Jewish Bible. Lecture. Limmud Copenhagen, Copenhagen, Denmark. 5th March 2017. GOLDENBAUM, Jean. Music in the Jewish Bible. Lecture. Limmud Helsinki, Helsinki, Finland. 30th January 2017. GOLDENBAUM, Jean. 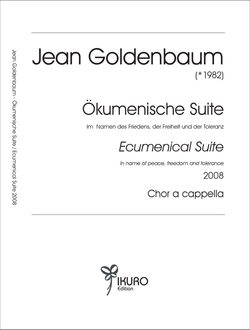 A Música de Jean Goldenbaum: o compositor por ele mesmo (The music of Jean Goldenbaum: the composer by himself). Lecture. Espaço Cultural Teekettle, São Paulo, Brazil. 17th December 2016. GOLDENBAUM, Jean. "V'khol znei zmara" - "And all kinds of music": the importance of music in the Jewish Bible and the posterior production of its imagery. Lecture. Espaço Cultural Ema Klabin, São Paulo, Brazil. 3rd December 2016. GOLDENBAUM, Jean. "V'khol znei zmara" - "And all kinds of music": the importance of music in the Jewish Bible and the posterior production of its imagery. Lecture. Limmud Sweden, Stockholm, Sweden. 20th November 2016. GOLDENBAUM, Jean. "V'khol znei zmara" - "And all kinds of music": the importance of music in the Jewish Bible and the posterior production of its imagery. Lecture. Bild un Klang 2: Ambivalenzen und Interferenzen (Tagung des Instituts für interdisziplinäre Bildforschung - Universität Rostock), Rostock, Germany. 4th November 2016. GOLDENBAUM, Jean. Jewish Classical Music Composers: The history explained and performed. Lecture. Jüdische Gemeinde Hameln, Hameln, Germany. 18th September 2016. GOLDENBAUM, Jean. Jewish Classical Music Composers: The history explained and performed. Lecture. Monash University (Limmud Oz), Melbourne, Australia. 27th June 2016. GOLDENBAUM, Jean. The history of the Jewish Classical Music Composers in Latin America. Lecture. Hochschule für Musik, Theater und Medien Hannover, Hannover, Germany. 9th May 2016. GOLDENBAUM, Jean. Jewish Classical Music Composers: The history explained and performed. Lecture. Liberale Jüdische Gemeinde Hannover, Germany. 4th April 2016. GOLDENBAUM, Jean. Jewish Classical Music Composers: The history explained and performed. Lecture. Vi & John Rubens House, Ilford (London), England. 25th February 2016. GOLDENBAUM, Jean. Jewish Classical Music Composers: The history explained and performed. Lecture. Michael Sobell Lecture Series (Michael Sobell Jewish Community Centre), London, England. 24th February 2016. GOLDENBAUM, Jean. Jewish Classical Music Composers: The history explained and performed. Lecture. Michael Sobell Lecture Series (Michael Sobell Jewish Community Centre), London, England. 23rd February 2016. GOLDENBAUM, Jean. Jewish Classical Music Composers: The history explained and performed. Lecture. Brenner Community Centre, London, England. 23rd February 2016. GOLDENBAUM, Jean. Jewish Classical Music Composers: The history explained and performed. Lecture. South Gate Progressive Synagogue, London, England. 23rd February 2016. GOLDENBAUM, Jean. Jewish Classical Music Composers: The history explained and performed. Lecture. Kenton United Synagogue, Kenton (London), England. 22nd February 2016. GOLDENBAUM, Jean; BRAGION, Alexandre; AMSTALDEN, Júlio. 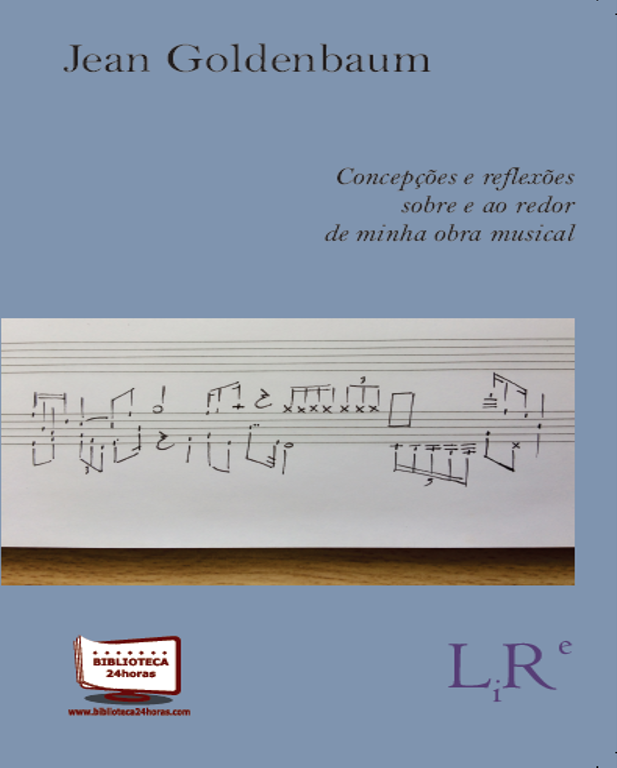 Música e Poesia contemporâneas: relações e perspectivas (Contemporary Music and Poetry: relations and perspectives). Universidade Metodista de Piracicaba. Piracicaba, Brazil. 30th September 2015. GOLDENBAUM, Jean. 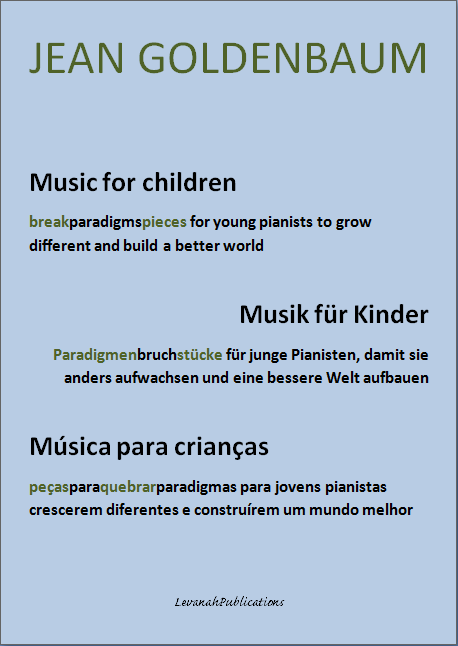 Neue Noten unter einem neuen Himmel: Die in Brasilien eingewanderten deutschsprachige Komponisten und deren Einfluss auf die brasilianische Musik (New notes under a new sky: the immigrant German-speaking composers to Brazil and their influence on the Brazilian music). Doktorarbeit. Universität Augsburg. 2013. GOLDENBAUM, Jean. Composição musical hoje: contexto e perspectivas (Music composition today: context and perspectives). Lecture. Universidade Metodista de Piracicaba (Methodist University of Piracicaba, Brazil). Piracicaba, Brazil. 21st March 2011. GOLDENBAUM, Jean. The music of Jean Goldenbaum: the composer on himself. Lecture. Wasa Sinfonietta Music Festival. Vaasa, Finland. 6th January 2011. GOLDENBAUM, Jean. Jean Goldenbaum: Symphony of the Good. Lecture. Akademie Brasil-Europa für Kultur- und Wissenschaftswissenschaft, in Gummersbach, Germany. 11th December 2010. GOLDENBAUM, Jean. 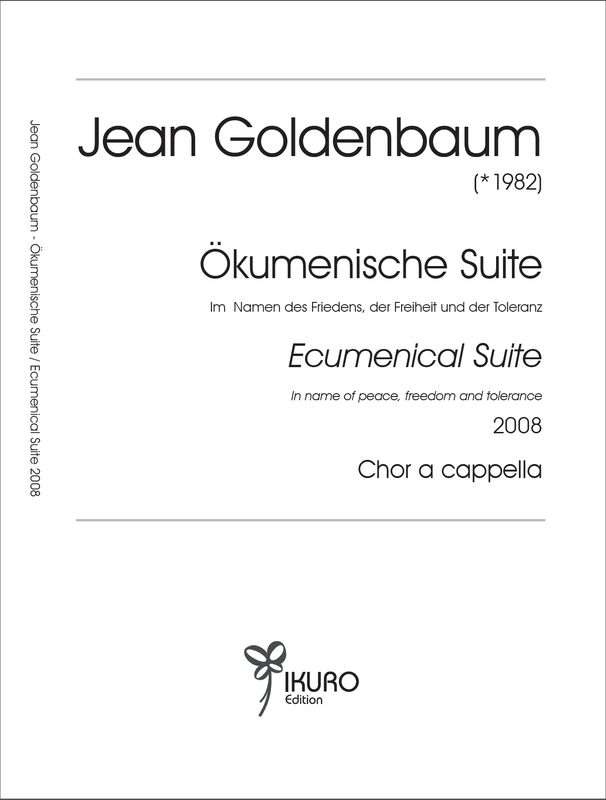 Ecumenical Suite: in the name of Freedom, Peace and Tolerance. Ikuro Edition. Stuttgart, Germany. 2008. GOLDENBAUM, Jean. Geschichte der brasilianischen klassischen Musik vom 16. Jahrhundert bis heute (History of the Brazilian classical music from 16th century to this day). Lecture. Institute of Musicology of the University of Augsburg. 10th January 2008. GOLDENBAUM, Jean. RINDERLE, Matthias. Die Musik von Rodion Shchedrin / Brasilianische Exilkomponisten im 20. Jahrhundert (The music of Rodion Shchedrin / Brazilian exile composers in the 20th century). Lectures. University of Augsburg. Augsburg, Germany. April-September/2008. GOLDENBAUM, Jean. TREMMEL, Erich. Musik und neue medien (Music and new media) Lectures. University of Augsburg. Augsburg, Germany. October/2007-March/2008. GOLDENBAUM, Jean. Catálogo das composições musicais de Martin Braunwieser (1901-1991): o processo e o produto (Catalogue of the musical compositions of Martin Braunwieser (1901-1991): the process and the product). Bachelor dissertation. Universidade de São Paulo. 2006.